This guide will help you create a template so you can start your MLA formatted paper with all the right margins already in place. At this moment, Google docs do not have as granular refining options and proper print capabilities to create that perfectly formatted paper. When and if they do, we will let you know with a "How to create an MLA template in Google docs." 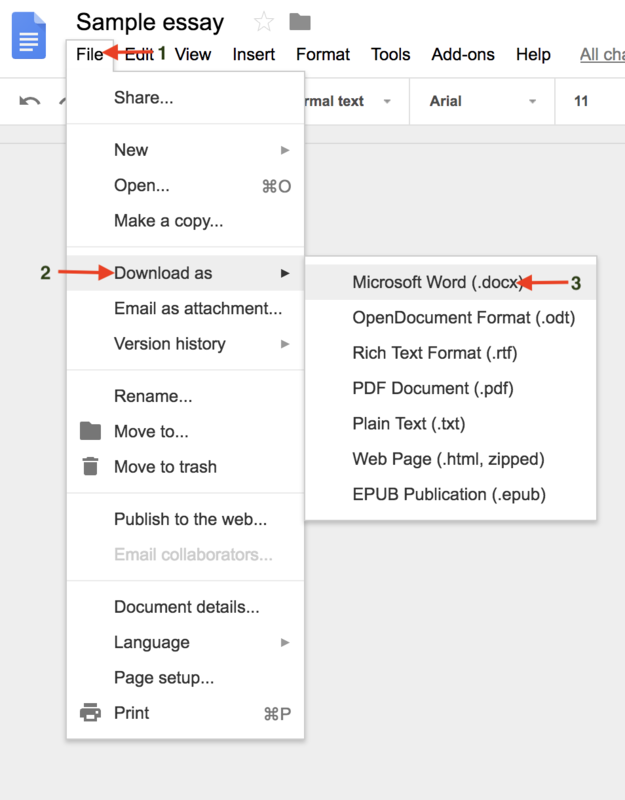 If your paper is in Google Docs to start with you will need to download it as a Word Doc(.docx). So, follow these preliminary steps: 1. Go to File. 2. "Download as" 3. 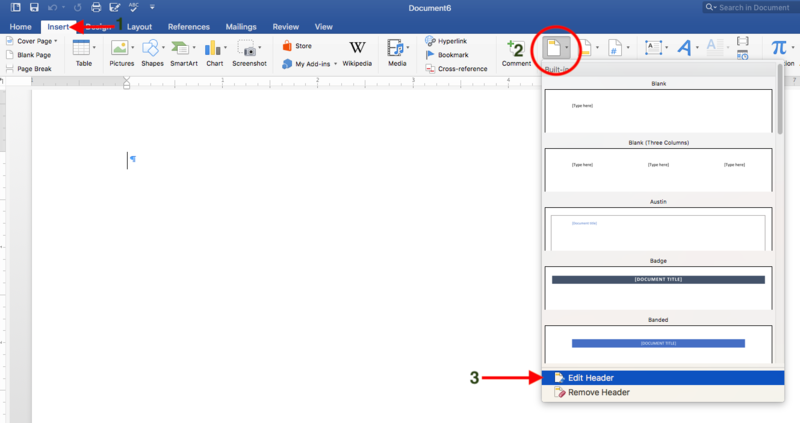 "Microsoft Word(.docx)"
Step 1: Now that your paper is in Microsoft Word let's start 1. select"View" and 2. choose the "Ruler" (you will need this later). Step 2: Now, you must set the 1. font style (Times New Roman) and 2. size (12), 3. get your spacing set up (2.0) and 4. turn on "Nonprinting Characters." This will also come in handy later. Step 3: Next, you go to the 1. 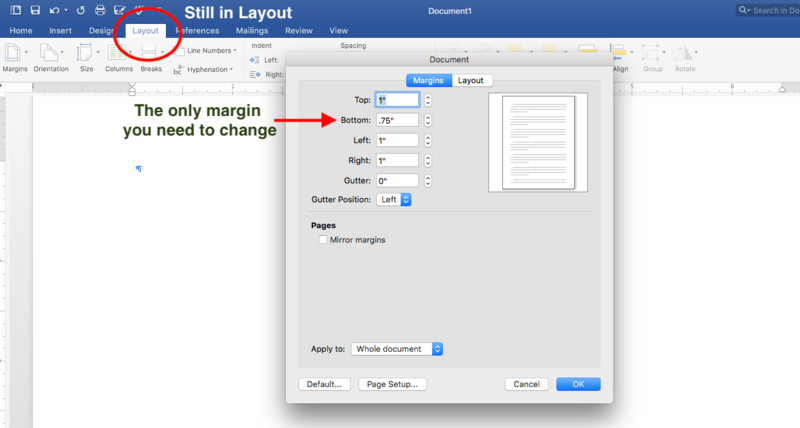 "Layout" tab and 2. select the "Margins" button on the far left top and 3. choose "Custom Margins..." down at the bottom. Step 4: A pop-up window will appear, change the "Bottom" margin to .75". Step 5: Still in the "Layout" tab, 1. select "Layout" button on the pop-up screen and 2. make sure the "Header" is set to .5" and 3. the "Footer" is set to 0". Then click "OK". Now move on to Tab 6-12 (above). 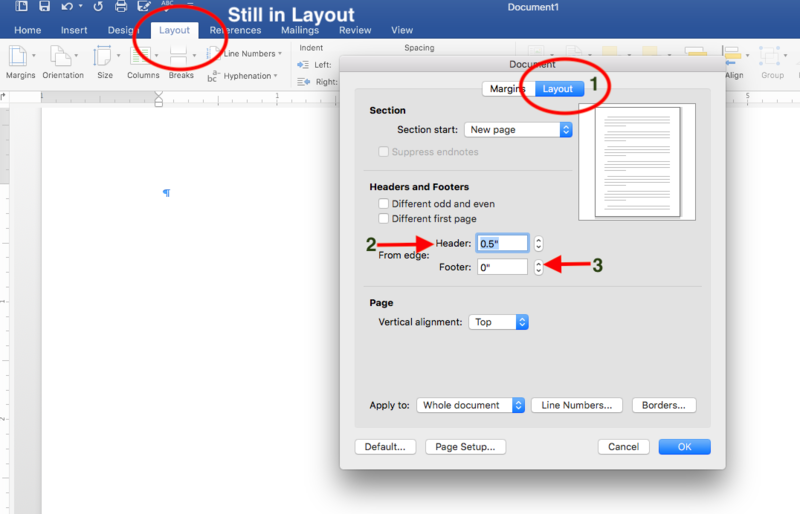 Step 6: You have the margins set, let's work on the page numbers and name alignment in the header. 1. 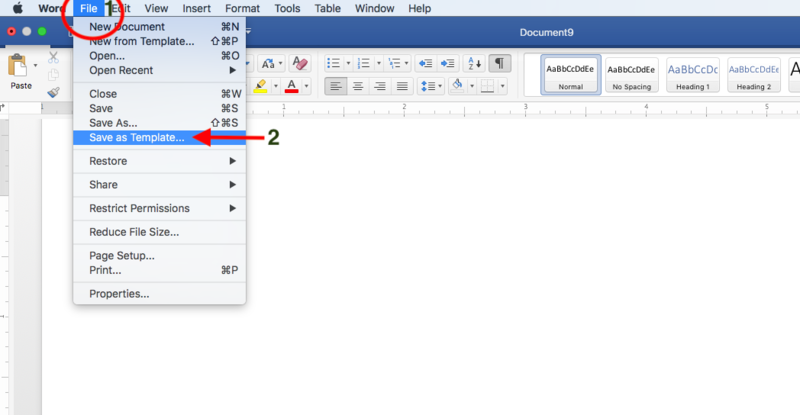 Select the "Insert" tab, go to the far right and 2. select the "Header" button, 3. choose "Edit Header" (at the bottom). Step 7: 1. Choose "Page Number" button 2. then select "Page Number" from the drop-down. Note "Footer from Bottom" should be 0"
Step 8: Make sure the defaults are right. Step 9: Voila! there is your consecutive numbering in your running header aligned to the right. Step 10: You need to get your last name aligned to the right. 1. Select the "Home" tab to the far left. 2. Make sure font is "Times New Roman" and font size is 12 (Sometimes this reverts to a default setting) 3. Then select the "Align Right" button. Sometimes the spacing here is off (not sure why). So print the first page only and make sure there is only a space between your last name and the page number, which is an 8th of an inch. If space is too large, follow step 11, if not move on to step 13-15 on the next tab. Step 11: This screenshot shows a space that is too big and needs to be shortened between the name and page number. Step 12: 1. Click on the "Layout" tab 2. Adjust the "Right" "Indent" to 0.15". This should resolve any spacing issues between your name and page numbers. Librarians' Suggestion: At this point of the process we suggest you highlight the complete document by hitting "Command A" and make sure your font is "Times New Roman" and the font size is 12. This will ensure that your font and size are correct throughout the entire document. YOU ARE NOW READY TO PRINT YOUR PROPERLY FORMATTED MLA PAPER. 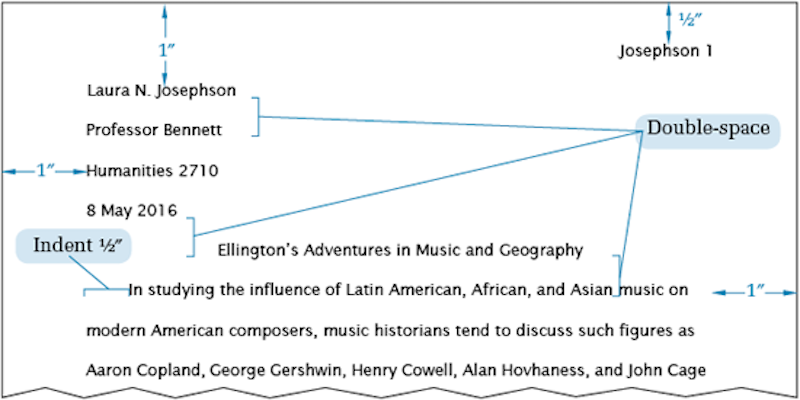 If you have MS Word on your computer and want to always have this properly formatted MLA paper saved as a template, delete any text you may have imported and move on to steps 13-15 in the next tab. Step 13: THIS DOCUMENT CAN BE SAVED AS A TEMPLATE. 1. "File" 2. "Save as Template ...". Step 14: First, give it a title, save it in templates file, choose file format as a Word Template (.dotx) and select save. Step 15: Finally, 1. select File then 2. link to "New from Template..." and voila there it is. You have now completed this task, and you have a "perfectly formatted" MLA template!